Our family of 13 had a superb trip on Utah’s Green River. 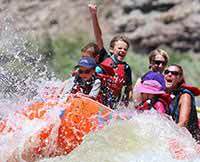 We had a party of 13 that did the Utah Green River Desolation Canyon rafting trip over the 4th of July. Our whole experince was excellent. The whole guide team was great and very accommodating. My wife and I brought our 2 grown daughters, their husbands, and 7 grandchildren (ages 5-10). The guides really made every wish and desire come about within the bounds of safety. Des, Lane, Sarah, and Melana were terrific. Thanks to you all we, our children and grandchildren will have life long memories of this trip. Western River Expeditions did a great job all around.